To bring a variation to advertising, promotional flags were introduced. Compared to billboards, promotional flags create a greater impact on viewers' minds because of their unusual appearance and varying shapes. These could be shaped in ways of tear drops, features, and quills or arranged to create definite patterns. Possibilities of innovation are significantly more with this variety of publicity as compared to other stationery methods, both outdoors and indoors. 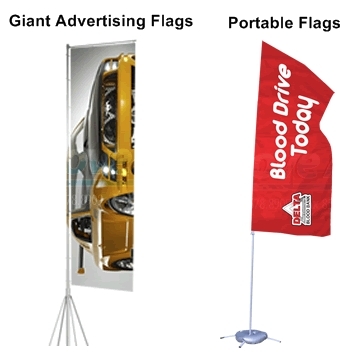 Promotional flags could be used both indoors and outdoors. These are fitted near to venues of exhibitions, trade fairs and any such event of public importance. Like all other outdoor advertising tool, these are used to draw the attention of visitors and interested passers-by. The most striking characteristic of these flags is that they are fixed to the ground and visible to both pedestrians and motorists. In outdoors, these are used to indicate direction, or the approach to a venue. Close to venue, these are used for indicating pavilions, stalls, or utility booths. The use of these promotional items also extend to indoor publicity. In shopping malls or indoor business fair venues, hanging of overhead banners is not advisable as viewing space is limited. Promotional flags placed in strategic locations create greater viewership and a more focused response. Inside an exhibition hall, these items of publicity are normally used for identification of stalls or providing instructions like 'stairs', 'washroom', or 'exit'. Stall owners use these as signboards for visitors. Though the purpose of promotional flags is purely publicity, whether used outdoors or indoors, there lies certain differences between these two varieties. Flags used outdoors are usually bigger compared to those used indoors. This is essential as outdoor kind is supposed to attract viewers' attention from a reasonable distance. For indoors, this distance is much reduced to within few meters. Secondly, promotional flags are one sided and made of lighter material. This allows them to flutter in the breeze and catch the attention of viewers much faster. Being one-sided, these banners have instructions written on one side with the other side, remaining blank. Single sided placards offer easy readability even from a distance. In contrast, flogs used indoors are of heavier material and double sided. Being double sided, scripts appear on both sides. To prevent script on one side to appear on the other, a lining is provided between two surfaces and stitched at the edges. Feathers, quills, and tear drops are some of the popular shapes of this publicity tool. An interesting characteristic about this tool, particularly when used outdoors, is their way of arrangement. A set of flags, for instance in the shape of tear drops, are arranged from smaller to larger, giving an impression of zooming. 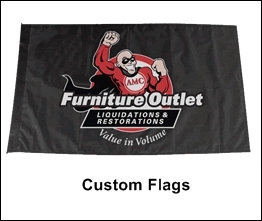 These sets of promotional flags are generally made from flex or PVC (poly vinyl chloride) which are water-resistant. Being water-proof, these materials remain unaffected by rain or snow. Promo flags in odd shapes help in grabbing the attention of passers-by more easily. More surprises await in days to come as far as publicity is concerned.